Javier Baez plays for the Chicago Cubs baseball team and was a crucial part of the team's historic World Series win in 2016. 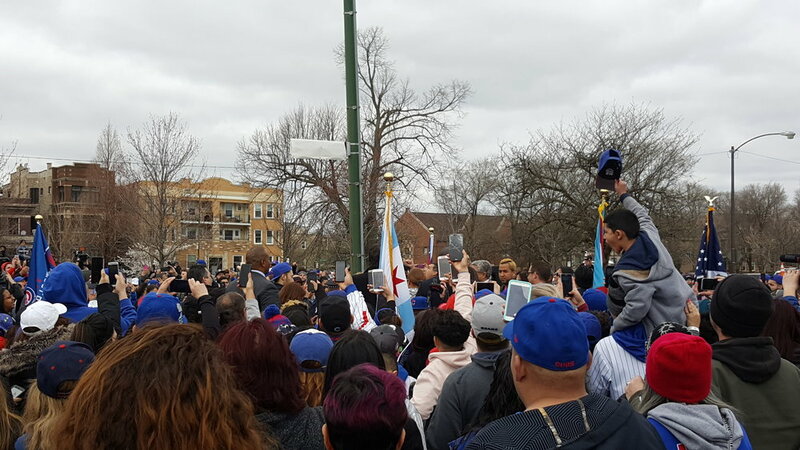 Honorary Javier "Javy" Baez Way was dedicated on Tuesday, April 11, 2017 and drew a huge crowd of adults and children from the proud Puerto Rican community and beyond, most were wearing Chicago Cubs hats, shirts, jackets, and Javy's jersey number 9. The sign stands in Humboldt Park in front of "Little Cubs Field" and also at the Division Street entrance to the park on Luis Munoz Marin Drive. The sign dedication was hosted by Alderman Roberto Maldonado and attended by Mayor Rahm Emanuel.